If you are Penn State, it’s very good that you are 5-2. But it’s not so good you are 0-2 against teams in the Top 25. Or are 0-2 in road games. It’s good you led those two teams – Temple and Ohio State – by a combined 13-0 in the first quarter. But it’s not so good you trailed 65-7 over the final three quarters. It’s good you won the first quarter 3-0 and the third quarter 7-0 against Ohio State on Saturday. But it’s not so good the Buckeyes won the second quarter 21-0, the fourth quarter 17-0 and the game 38-10. 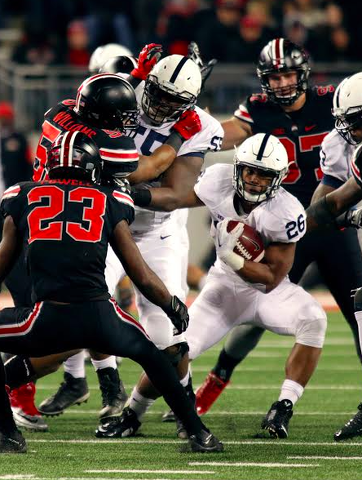 It’s good – actually, it’s great -- that your freshman running back Saquon Barkley ran for 194 yards against Ohio State. It’s not so good your quarterback Christian Hackenberg threw just seven passes over the final three quarters. It’s good you cut your losing score to Ohio State from 63-14 in your previous visit to The Shoe in 2013 to 38-10 in 2015. But it’s not so good you have lost six of your last seven games at Ohio Stadium -- by an average losing margin of 22.7 points per game. It’s good your defense held starting Ohio State quarterback Cardale Jones to a combined 68 yards passing and rushing. It’s not so good that his back-up, J.T. Barrett, was 4 of 4 passing for two TDs and ran 11 times for 102 more yards and two additional touchdowns. It’s good Hackenberg came out firing to start the second half at Ohio State, completing a 56-yarder to Chris Godwin and a 8-yard TD to DaeSean Hamilton, especially with both receivers making Herculean efforts for extra yards and, in Hamilton’s case, a diving score. It’s not so good your talented PSU quarterback was able to get off only three more passes the rest of the night. It’s good that one of them, a deep streak to the long-forgotten Saeed Blacknall, drew an Ohio State pass interference penalty. It’s not so good that the drive ended when Hackenberg lost the ball on a fumble after being sacked. It’s good Hamilton worked like crazy to score that touchdown. It’s not so good it was only his second reception of the game, compared to 14 vs. Ohio State in 2014. It’s good your offensive linemen who played the second half of the Ohio State game on Saturday were the same ones – plus Paris Palmer -- who blocked your way back from a 17-0 deficit into overtime in 2014 after offensive tackle Donovan Smith was hurt. It’s not so good that there doesn’t seem to be any progress in pass-blocking in the year since and that Hackenberg was sacked five times. It’s good he wasn’t sacked more. It’s not so good it’s come to this. It’s good you have two punters from whom to choose. It’s not so good that you have two punters from whom to choose, and use them in a way that lacks any continuity or builds confidence in an area that is already severely lacking. It’s good The Big Toe was back to his old big self at The Shoe, making a 33-yard field goal, a PAT and good decisions on kick-offs. It’s not so good you had zero punt return yards and averaged just 16.7 yards on seven kickoff returns. It’s good you were in position to capitalize on big first-quarter plays like a sure-thing first-down pass to tight end Mike Gisecki in the red zone or an apparent 44-yard TD run by Barkley one play later. It’s not so good that seven games into the season mistakes like a dropped ball and a holding penalty by a veteran lineman cost you seven points and a 10-0 first quarter lead on the road against the No. 1 team in the country. It’s good for your future that you have the youngest team of starters in the Big Ten. It’s not so good for you to count on the inexperience of a true freshman backfield of Barkley and (usual wide receiver) Brandon Polk, along with sophomore Gisecki and first-year left offensive tackle Palmer, manning their spots in a crucial third-down play deep in your own territory in the third quarter. It’s good for Pennsylvania college football that Temple (22nd) and Pitt (25th) are in the AP Top 25 – Temple for the first time since the end of 1979 and Pitt for the first time since preseason 2010. It’s not so good if you’re trying to dominate the state and already got drubbed by Temple in the season-opener. 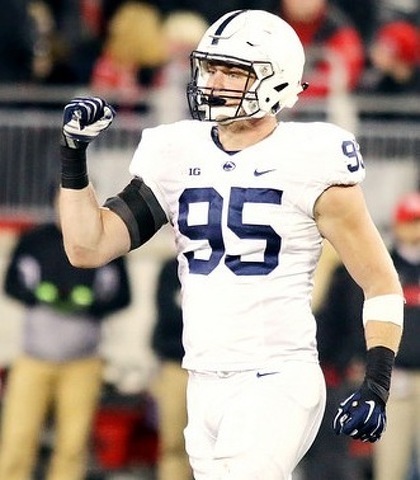 It’s really good your defensive end Crazy Carl Nassib leads the nation in sacks (with 11.5) and your defense is ranked second nationally for sacks. It’s not so good your offense has given up more sacks (24) than all but two of the other 127 FBS teams – and 68 sacks over the past 20 games. It’s good Hackenberg gutted through some injuries to stay in the game against Ohio State while it was still a game. It’s not so good he was still in the game at the end, limping like crazy, when it wasn’t a game and you were down 28 points. It’s good Hackenberg has only two interceptions so far in 2015 (whereas he had nine in the first seven games of 2014). It’s not good he’s thrown only 177 passes (compared to 276 in the first seven games of 2014). It’s good tight end Adam Breneman saw playing time against Ohio State for the first time since 2013. It’s not so good veteran tight end Kyle Carter was injured and couldn’t make the trip, leaving Gisecki and Brent Wilkerson as the your only healthy and experienced tight ends. It’s good your head coach James Franklin and your offensive coordinator John Donovan coached on the same Terp staff in the past with Mike Locksley, the interim head coach of Maryland, who you play on Saturday in Baltimore. It’s not so good that Locksley and the Terrapins have had two weeks without a game to regroup after the firing of Randy Edsell. There was no guarantee it would go this way. Penn State could have walked out on the the field with hopeful star Saquon Barkley in the backfield and watched his early season success turn out to be the result of opponents. A good player running past not so good players. That's not what happened though.